Yes Liem! 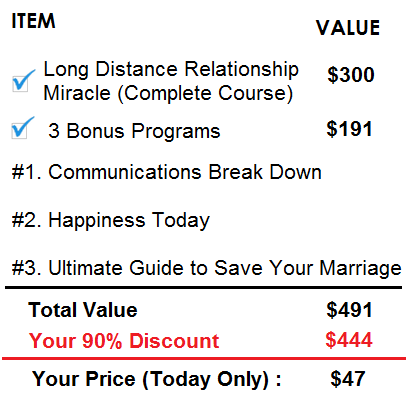 I want to get immediate access to the complete “Long Distance Relationship Miracle” program. I understand that I am at absolutely zero risk because my purchase is backed by a 60 day money back guarantee which means that if I’m unhappy with the product for any reason, then I can just send you an email and get a full no questions asked refund. Also, my order will be processed by Clickbank using a secure server. Clickbank is the world’s largest and most trusted online e-commerce outlet. This is a one time only payment of just $47. There are no other recurring or monthly payments or hidden fee. Your privacy will be maintained as the charge on your statement will show as “Clickbank” or “CLKBANK*COM”. If you’re unhappy for any reason, simply contact us at support@longdistancerelationshipmiracle.com for a complete refund.